Luke Behme grew up in Carlinville, Illinois surrounded by small businesses including his mother's accounting firm and his grandfather's farm. He has seen first hand the issues that self-employed and small business owners encounter in the planning stages and the day to day operations of their businesses. Growing up, he was an active member of both 4-H and FFA where he received his American FFA Degree. At UIUC, he was an active member and officer in organizations such as ACES Student Advancement Committee, ACES Global Ambassadors, and ACES Student Counsel. He graduated with a Bachelor of Science degree in animal sciences and received a Minor in International Agriculture, Consumer and Environmental Sciences. While at St. Louis University School of Law, he was involved in the SLU Law Ambassadors program and the SLU Law Mentors program. He received a Certificate in International Law along with concentrations in Taxation/Estate Planning and Business Transactions. While in law school, he interned with the office of the Illinois Attorney General and primarily worked on business compliance and administrative law issues. He also clerked at a small boutique law firm where he gained litigation experience. 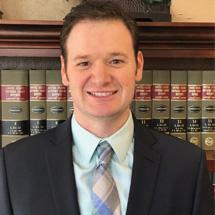 Since being admitted to the Illinois Bar, Mr. Behme has practiced throughout Southern Illinois in the areas of family law and general civil litigation. He has also had a substantial appellate practice.